London is the capital of England and Great Britain, which is well-known for many places to visit. It is the most densely populated city in the country. The location of the city on the River Thames allowed it to become the center of history, trade and politics of the country for two millennia. Here you can visit the Queen’s official residence in Buckingham Palace and make a trip to the House of Commons and the House of Lords – the historic home of the British government. In London, there are a lot of historical sites that reflect the cultural richness of the city. Four of them have been declared UNESCO World Heritage Sites: the Tower of London, the Royal Botanical Gardens of Kew, Westminster Abbey, where the coronation of the English monarchs has taken place since 1066, and Greenwich, the area where the Royal Observatory is located, which marks the Greenwich Meridian. London is the best place to shop in Europe. Whether you’re heading to the West End, Stratford City Westfield or London market, there’s a huge range of places to buy gifts, fancy things and products. The main shopping streets are Oxford Street, Carnaby Street and King’s Road. Visiting London is a great idea if you want to get acquainted with this bright city full of interesting places to visit. Big Ben is perhaps the most famous landmark in London. Although often by the name “Big Ben” people mean the clock tower of the Palace of Westminster, the official name of which is the “tower of St. Stephen”, in fact, Big Ben is the biggest bell of the six located in the tower. The height of the tower is 96 meters, inside it there is a narrow spiral staircase of 334 steps. Going through them, you can get to a small open area, which is the famous bell of Big Ben. You can hear the bell every hour and its sounds are transmitted every hour on the BBC radio. It was this bell that gave the name to the clock and to the tower itself. The bell is large: 2 meters in height and 3 meters in the base. The dimensions of the watch are no less striking: their diameter is 7 meters, and the arrows have a length of 2.7 and 4.2 m.
The construction of the St. Stephen’s tower was completed in 1858, and in September 1859 the clockwork mechanism was launched. The clock tower has interesting architectural and symbolic details, for example, on all four dials, except for the time indicating and on the sides of the light, the inscription “God Save the Queen Victoria!” is inscribed, and on the tower near the clock there is the inscription “Praise the Lord”. Latin is used for both inscriptions. 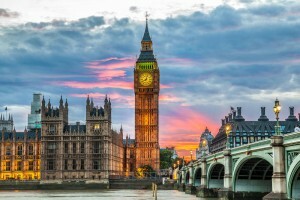 Interesting: It is difficult to imagine a visit to London without going to the Palace of Westminster, which in itself is a famous landmark, and its clock tower, inside which there is the “world-wide” Big-Bell bell. One of the few in the modern world of operating royal palaces is the Buckingham Palace. 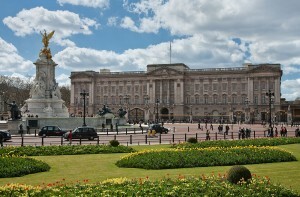 This is the official residence of Her Majesty the Queen in London. The area of the palace with a garden is about 20 hectares, here there is a police station, two postal offices, a hospital, a swimming pool, a bar – in fact, this is a whole city. In the palace itself there are 775 rooms, among them there is the official working room of the queen. The service staff of the palace consists of about 700 people. Initially, the palace was built for the Duke of Buckingham, in 1762 it was purchased by King George III, completed and, upon accession to the throne of Queen Victoria in 1837, declared the main residence of British monarchs. But the most spacious and richly decorated room – the ballroom – was completed only in 1853. After that, the interiors of the palace were changed many times, remaining invariably luxurious. Changing the guard at Buckingham Palace is one of the most recognizable ceremonies in the world – a lot of tourists are going to see this spectacle: guardsmen from the Court Division demonstrate impeccable training and absolute equanimity. magnificent collections of paintings belonging to the British queen. All of these things can be seen during an excursion to the palace. Of particular interest there are the Royal Stables, which since 2011 are open for visits all year round but are still operational. Royal Stables perform the tasks of organizing all the travels of the queen and members of the royal family. A golden carriage for coronations and a transparent coach for brides, not always, but in the stables you can find the royal horses. There is a shop in the palace that specializes in selling goods from the so-called “Royal Collection”. These goods are identical to those items of everyday use that are used in the daily life of the palace: accessories, towels, kitchen utensils, various trifles. It is not cheap, but it can become a wonderful souvenir from London. Interesting: On the first visit, you can ask to stamp the ticket and then it will be valid for repeated visits within one year. Object No. 426 on the UNESCO World Heritage List is St. Peter’s Cathedral Church in Westminster or Westminster Abbey. 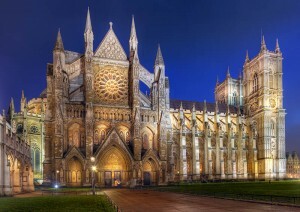 A remarkable example of early English Gothic architecture, Westminster Abbey was laid more than a thousand years ago. Today it is the main shrine of the British nation, its symbol. Most of the monarchs of this country, since 1066, were crowned here, eighteen of them are buried. On May 8, 1945, when the World War II was officially announced, short prayers of thanksgiving were held every hour in the cathedral, in which about 25,000 people, from the Lord Chancellor to the rank and file of the British, took part. Recognized silhouette of the abbey with two towers and numerous openwork arches, its magnificent stained-glass windows and richly decorated interiors always attracted tourists. As a result the abbey became one of the most visited sights of the world. The interiors of the abbey are interesting not only for the skillful decor, but also for tombstones of people buried there. Total gravestones are about 3000, and in one of the noteworthy places of the abbey – the Corner of Poets – are the graves of the great English writers. tapestries and rare beauty church utensils. Interesting: A special pride of the abbey is the collection of ancient folios and unique archival documents, which allowed it to become a significant research center. Hyde Park is one of London’s most loved parks, despite the fact that it is always crowded and all tourists are eager to see for themselves the existence of a kind of “stronghold of freedom of speech”. Speakers’ Corner is the main local attraction where everyone can publicly speak about the most important things. You can talk on any topic, except for calls to violence – it is also not allowed to use abusive words. Microphones are not allowed, and up to 12 people can sit at the same time, so if you want to be heard, you’ll have to try. Why is Hyde Park one of the most favorite places of tourists? The park itself is very picturesque. In the summer many flowering plants can be seen here. On the territory of the Hyde Park there is the Serpentine lake, where you can swim. The art gallery of the same name invites you to exhibitions of contemporary art. 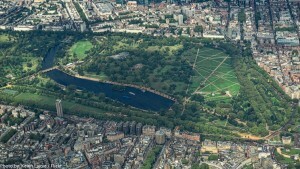 Interesting: From the west to Hyde Park Kensington Gardens are adjacent – the royal park around Kensington Palace. Sir Arthur Conan Doyle and the literary hero he created is the illustrious detective Sherlock Holmes with his deductive method and faithful friend Dr. Watson … are there many people on Earth who have never heard of them? 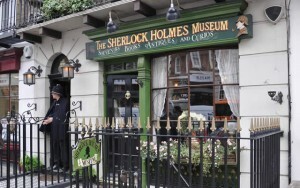 It is these characters London owes its most famous address: Baker Street, 221b, Westminster. By the way, not everyone knows about this, but at the time of writing the works this address was not yet in London: Baker Street in those days ended in the hundredth number of houses. Getting into the four-story building of the monastery of the great detective, as if you take a step back in time, appearing in precisely reproduced rooms, atmosphere in details drawn by Arthur Conan Doyle in his works about the detective. Near the door there is a real policeman, dressed in the form of the 19th century, and all the guides are dressed in the maid of Victorian times. The second floor is a living room with windows on Baker Street and a bedroom with windows facing the courtyard. Here, everything is exactly as in the books: the Sherlock’s violin, the letters attached to the mantelpiece with a penknife, the cones with the test tubes of his chemical laboratory, and Dr. Watson’s revolver, the faithful friend and helper of Holmes. You can even sit in the detective’s chair by the lighted fireplace and take a photo with his famous tube. The third floor of the museum is given to the rooms of Mrs. Hudson, who appears all the time on the pages of the stories next to Sherlock. In this room there is a bronze bust of Holmes and a book with reviews and wishes of the guests of the museum. By the way, it is “Mrs. Hudson” who meets and accompanies everyone through the rooms of the museum. On the third floor there is also a Watson room with many books on medicine and other “personal items” of the famous doctor. Finally, on the fourth floor of the museum house you can see the wax incarnations of other heroes of the works of Arthur Conan Doyle. Interesting: After a walk in the museum, you can drink a cup of English tea with cream in the “Old English Restaurant of Mrs. Hudson” to complete the impression of England’s Victorian time. 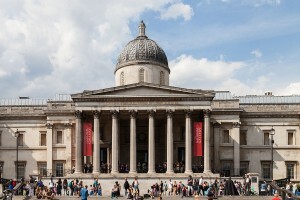 The National Gallery is one of the largest art galleries in the capital of Great Britain. It exhibited more than two thousand masterpieces of Western European painting from the 12th to the 20th centuries, and all the paintings in the exposition are arranged in chronological order. The gallery was opened on April 9, 1839, but the date of its founding is May 1824 – at this time a collection of Angershtein paintings was acquired, numbering 38 works. The National Gallery has a truly huge number of masterpieces of art, it is impossible to see them all in one visit. At the Espresso Bar or The National Café, you can relax and have a cup of coffee. In souvenir shops and art shops – buy souvenirs, books and copies of paintings exhibited in the gallery. Directly in the museum you can listen to audio lectures or view multimedia presentations about paintings and their authors in the Sainsbury Wing or in the already mentioned Espresso Bar. Collection of works of the National Gallery is constantly replenished both at the expense of private investments, and with the help of charity funds. Recently, the collection has been replenished with several works by Durer, Bermejo, Sulfur and Altdorfer. The gallery exhibits many world-famous paintings, including “Venus with a Mirror” by Velasquez, “Sunflowers” by Van Gogh, “The Holy Family” by Titian and “Landscape with the Castle of Sten” by Rubens. If you compare the collection of the National Gallery with the collections of other major galleries – such as the Louvre or the Prado – it does not seem very rich. 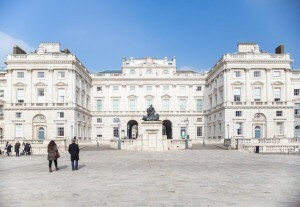 But in favor of the London gallery says the fact that under its roof there are masterpieces of all European schools of painting for the period from the mid-13th to early 20th century. Another reason for pride is the extensive collection of works by Titian, from the earliest to the latest. Naturally, in the National Gallery you will find a lot of works of court artists of English kings – Anthony van Dyke and Hans Holbein. The gallery contains an extensive collection of works of Venetian artists, such as Mantegna and Bellini. The Italian masters are represented by the canvases of Filippino Lippi and Antonio Pisanello. Fans of Rembrandt’s art will also have something to look at – the gallery owns a fairly large collection of his works, reflecting the life of the great painter. Great Rubens is represented no less widely – in the collection there are 24 paintings by this Dutch master. Most of the works in the gallery belong to the late period of the work of Rubens. Interesting: In addition to the above mentioned, the gallery presents a lot of works of German, French and Flemish masters. It is named after the victory of the British fleet under the command of Admiral Nelson at Trafalgar in 1805, and is important for any aspect of London life. It was in Trafalgar Square in 1945 that Churchill announced to the Londoners that the Second World War had ended. 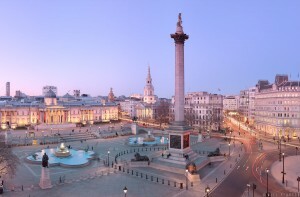 Trafalgar Square is a historically significant place in London. In the middle of the square there is a column crowned with the figure of Admiral Nelson, at the foot of the column – bas-reliefs, smelted from guns captured from the defeated Napoleon. At the corners of the square there are four pedestals, three of them are occupied by statues of outstanding British, and the fourth continues to be empty: the British cannot decide who is worthy to occupy this place. There are rallies and demonstrations, as well as festivities held. the Arch of the Admiralty and several buildings of foreign embassies. Despite the fact that the buildings are different in their purpose, and in their style, they perfectly complement each other and the area remains for a long time not only in the photos of tourists, but also in their memory. Interesting: One of the landmarks of the square is flocks of pigeons that like the area thanks to the tourists who fed them. In some incomprehensible way, city ecologists managed to count the birds. It turned out that they gather in the area of up to 35,000. The building is called Somerset House. The first palace on this site was built, correspondingly, by the Duke of Somerset, regent under the young king – the son of Henry VIII. The story ended badly: the duke was executed, the palace became the property of the crown and remains there until now (with a small pause during the Civil War). The palace was rebuilt, enlarged and acquired a stormy history. Here in the youth (before the coronation) the future Queen Elizabeth I, the daughter of Henry VIII lived. The Art Institute of Courtois was founded in 1932 at the University of London as an independent college, working at its own expense (which it received from philanthropists). There they taught art history and other art-related disciplines. The founders who created and paid for this college were three, and they all owned large collections of works of art. Now in the collection there are more than 26 thousand exhibits, covering the period between the 15th and 20th centuries. Interesting: Here you can see paintings by Peter Brueghel the Elder, Fra Angelico, Botticelli, Tintoretto, 29 paintings by Rubens, canvases by Van Dyke, Lucas Cranach the Elder and Gainsborough, but most importantly – the best in Britain collection of impressionists and post-impressionists.